When the 2018 offseason program began last April, it looked like the Rams would return their same starting offensive line that had helped propel the team to an 11-5 record and an NFC West division title in 2017. And, really, it looked that way until July, when the league announced former Rams guard Jamon Brown would be suspended for the first two games of the 2018 season. Nevertheless, for most of training camp, Brown was at his usual spot of right guard, sandwiched between center John Sullivan and right tackle Rob Havenstein. But as the season got close toward the end of August, L.A. had a decision to make as to who would start in place of Brown for those first two games — Austin Blythe or Joe Noteboom. 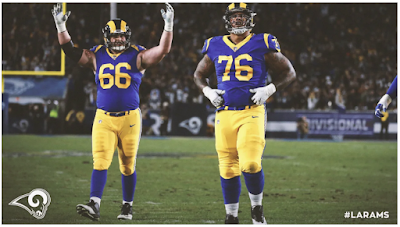 With Noteboom a rookie and the ideal heir apparent to left tackle Andrew Whitworth whenever he decides to hang it up, the TCU product wasn’t necessarily the ideal candidate. But Austin Blythe really was. He’d spent the 2017 season with Los Angeles, and practiced with the first-team offensive line throughout the course of the year at center when Sullivan would take a veteran rest day. That prepared him for spot duty with the club’s offense, as he filled in admirably in a few contests throughout the year, before starting the Week 17 matchup against San Francisco in which head coach Sean McVay elected to rest most of the team’s starters. Fast forward to Week 1 of the 2018 season, and Blythe showed he belonged by making key blocks against the Raiders as the Rams began the year 1-0. He kept it up in Week 2, displaying his mettle in Los Angeles’ 34-0 shutout victory over the Cardinals. That’s when McVay and run game coordinator/offensive line coach Aaron Kromer made the decision: Blythe would be the starter at right guard going forward. “With the success we've been having, we want to keep the continuity and I think that has helped out,” Kromer said back in September. Blythe kept the job for the entire year, playing 100 percent of Los Angeles’ 1,100 offensive snaps in the 2018 regular season — plus each one in the postseason. It’s not the be-all-end-all metric, but Pro Football Focus had him as their No. 12-rated guard and No. 23 overall offensive lineman in 2018. “Anyone could have had one of the top-25 offensive linemen in the NFL after he was waived by the Colts a year and a half ago. The former seventh-round pick wasn’t even supposed to start for the Rams until Jamon Brown got suspended. Blythe never relinquished control of the job and has been reliable ever since,” PFF wrote of Blythe. But speaking to therams.com just after concluding his first season as a full-time starter, Blythe was grateful for his opportunity. Blythe said to that point he hadn’t watched Super Bowl LIII back — and he wasn’t sure if he would in the near future. He wasn’t happy with his own play, and, certainly, the game’s ultimate result. The right guard did, however, say that overall he really enjoyed playing football this year for Los Angeles, and it’s not something he takes lightly. There’s always turnover in the NFL, and there surely will be for the Rams as they flip from 2018 to 2019. But given the strong chemistry of this past year’s club, Blythe believes the Rams can compete next year and into the future.